"Picketty (the rich get richer), Gordon (the important innovations are already behind us), Tainter (it's too complicated) all have theories about why the 21st century is such a disappointment. James Dale Davidson connects the dots...but more dots...and more unexpected dots...than perhaps anyone." IS YOUR PORTFOLIO POSITIONED FOR THE GLOBAL FINANCIAL REVOLUTION? The global economy as we know it is due for a major correction, and with this will come permanent, systemic change: the greatest economic freedom the world has ever seen. But hard financial times are ahead, and The Breaking Point will help you protect your wealth and prosper through it all. 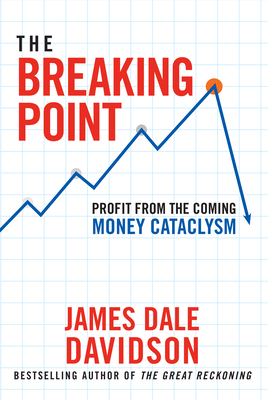 Providing a painfully clear view of the state of the global economy, outspoken economist James Dale Davidson uses the old-fashioned tool of argument--facts--to describe how governments have mismanaged the financial system to the point of no return. It has all led to Brexit--the opening salvo in the war for financial freedom. The Breaking Point shows you where we've been and where we're headed, offering the insight and information you need to ensure you're positioned for the worst of times-and the best of times. James Dale Davidson is an economist and author of several financial books, including of The Sovereign Individual: Mastering the Transition to the Information Age, The Great Reckoning: Protecting Yourself in the Coming Depression, and Blood in the Streets: Investment Profits in a World Gone Mad. As a current member of the Newsmax Financial Brain Trust, he is a frequent contributor to Financial Intelligence Report.